Tissue Salts or Cell Salts are the basic chemical building blocks found in the body. If the water in your body were taken away, the result would be a pile of the compounds listed below. They are used in the body on a cellular level, and too much or to little of these compounds can result in disease. These conditions can be corrected by restoring proper levels of Tissue or Cell Salts. Below is a brief overview of the 12 Biochemic Tissue Salts that make up the Human Body and the diseases that may occur when overabundant or in short supply. This information is paraphrased from “The 12 Tissue Remedies of Schussler“, by Boericke & Dewey. Another very useful quick reference guide to tissue cell salts is The Biochemic Handbook, How to Get Well and Keep Fit with Biochemic Tissue Salts. If you would like a more complete understanding of the actions of biochemic tissue (cell) salts, contact Homeopathy for Health. Tissue Salts can be purchased locally at most health food stores or on the web at Homeopathy for Health or Vitacost.com. If you would like to buy the salts online, just click the button next to the item you are interested in. Click here if you would like to see a list of locations where you can buy cell salts in the Lehigh Valley. 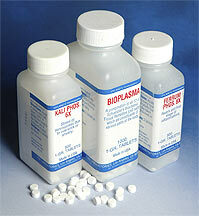 Many people have found Bioplasma is important for general health, prevention of illness, and in healing. Remember these minerals go right to work inside the cells. Great for those who absorb supplements poorly or who have digestive problems. Calc Fl, Silicea, and Nat Mur in 6X potencies, the other 9 minerals are 3X potency. Blood Plasma, Corpuscles, Saliva, Bones/Teeth, Connective Tissues. Anemia, Infant (Frequent Nursing, Colic), Eye Twitching (after Mag. Phos. ), Skin Scales in Ear Canal, Nasal Fungous, Rapid Tooth Decay. Twitching Eyelids, Headcold with Thick Yellowish Mucous, Great Thirst and Appetite, Sleeplessness at night, tired during daylight. Hemoglobin where it attracts Oxygen, and Hair. Anemia, Constipation, Varicose Veins, Hemorrhoids, Incontinence, First stage of Colds and Inflammations, Fresh Wounds. Blood Corpuscles, Muscles, Nerve and Brain Cells, Intercellular Fluids. Colds or Pneumonia with White Mucous, Colic, Swollen Glands, Feet, or Ankles, Closed Eustachian Tubes, Severe Burns (Compress), Herpes Viruses including; Lupus, Shingles, Measles, Mumps, Chicken Pocks, Glandular swelling, Whitish-gray coated tongue, Scaling skin, Specks of matter on eyelids, Superficial flat ulcer of the eye, Loss of appetite. Muscles, Nerves, Blood Corpuscles, and Epithelium where it carries Oxygen. Nervous Fatigue, Shakiness under minor stress, Muscular twitching when falling asleep, Loss of mental acuity, Sciatica, Nervous Depression, Night Cramps that improve with motion, Vertigo when rising. Muscle, Nerve, Brain (Grey), Bone, Spine, Sperma, Teeth, and Blood Corpuscles where disturbance of molecular motion will cause cramping and or Paralysis. Cramps, Nervous Asthma or Exhaustion, Eye Twitch, Photophobia, Goiter, Spastic Bladder, Menstrual Cramps, and all forms of Inner Ear Disease. All liquids and solids of the body, where it facilitates the uptake of fluids into the cells. Colds, Allergies (with Watery or Dry Hacking Cough, Watery Stools), Hayfever, Frontal Sinus Inflammation, Sunstroke, Menstrual Headaches, Granulated Eyelids with Red Edges, Bleeding Gums, Melancholia. Muscle, Brain, Nerve, and Intercellular Fluids where it decomposes Lactic Acid. Jaundice, Colic, Poor Fat digestion, Achy after Exercise, Gout, Arthritis, Teeth Grinding, Restless Sleep, Red Blotchy Face, Creamy Yellow Coated Tongue, Right Groin Pain. Diabetes, Colic, Occipital Headaches (Increased by Dampness and Lying on Left Side), Photophobia, Ulcerated Sore Throat, Excess Gall (Stones), Prostatitis, Flatulence, Sensitive Liver. Cold Sores, Headaches from Mental Fatigue or Hunger (relieved by warmth), Foot Sweat w/ Offensive Odor, Eczema, Ulcers, Boils (Acne).